Home » ads , airpush , android , app , camera , filter , fingersoft , infrared , night vision , review , see in the dark , smartphone , thermal camera » Android App Reviews - See in the dark, night vision and thermal camera apps! Android App Reviews - See in the dark, night vision and thermal camera apps! Well, we tried looking into it. There are several night vision, see in the dark and even thermal camera apps and we tried testing them - can we use them to really see in the dark? Well, the answer is mostly no, and we'll get into in a moment. The apps we tried are Night Vision Camera by Fingersoft, Night Vision Cam by andro iX, Night Vision by Crazy Apps Maker and Night Vision Camera by Night Vision Inc. In addition, we tried Thermal Camera by Fingersoft, Thermal Vision Camera by Mister Borken and Thermal Vision Camera by M-Apps. Our conclusion is simple. The thermal camera apps do not work, at least not in the way we might think. It's no secret by the way, some say it on their description on Google Play. The smartphone's camera cannot pickup IR wavelengths, so you cannot use the thermal camera apps to see at night. What you get, which is cool in itself, is a real time filter which gives pictures which look like the ones from the Predator movies. What about the night vision apps? Those apps work a little better. What they do is, increase the light from ambient light sources and they take pictures in green colors, just like in the movies. 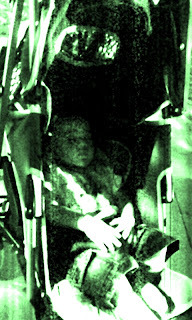 On our testing, they were able to take reasonable (green tinged) photos in near total darkness. So, in conclusion, night vision apps do kind of work, just be sure you understand what kind of pics you get. Of course, Night Vision Camera by Night Vision Inc. prompted us to install AirPush which will put adds on the smartphone's nitification bar and home screen. Of course app developers should earn money for their efforts and ads are a great way to do that, but enough is enough. Ads on the notification bar and home screen is taking this too far.